I LOVE GOD’S WORD. It is true. It is faithful. It is alive! It is powerful for changing our lives. I love this passage of Scripture. It is so good! In fact, you should just click on the reference, which takes you to the chapter, and read the whole thing. It will encourage your heart! If you’ve spent any amount of time on my blog, you know that my posts are almost always chock-full of Scripture. There’s a reason for that. The name of my blog, Sweeter Than Honey, comes from a verse in Psalm 119. So it should be no surprise that the verses above are among my very favorites–especially verse 11. I want to share it with you in several translations. So is my word that goes out from my mouth: It will not return to me empty, but will accomplish what I desire and achieve the purpose for which I sent it. (NIV). So will My word be which goes out of My mouth; It will not return to Me void (useless, without result), without accomplishing what I desire, And without succeeding in the matter for which I sent it.(AMP). Gigi Graham Tchividjian, one of Billy Graham’s daughters, talks about God’s purposes and plans for our lives in her book, A Quiet Knowing. She tells this story. One winter, in our home near Milwaukee, Wisconsin, I was reading in my bedroom when I happened to glance out the window at our big oak tree, which was in the middle of our circular driveway. All of the leaves had fallen, but up in the top of its branches I saw a big bunch of ugly, brown leaves. I didn’t think that they looked very nice, but I didn’t se how I was going to be able to climb up there and pull them off. So I went back to reading. A few months later, I was sitting by that same window and noticed that the big bunch of brown leaves in the old oak were gone and that in their place were new, bright green leaves. I hadn’t even noticed, but as the new life of spring began to flow through the tree and the new leaves began to sprout, the brown leaves just fell off all by themselves. Often I find myself focusing on a particular area of my life–unsatisfied with it. Wondering when I’ll ever get it together. Sometimes I look at my children’s lives and wonder the same thing. And … for those I share my faith with, who do not choose Christ, I wonder … Will they? The truth is, when we are in God’s Word, He will do the work. When I share my faith–God’s Word–with someone else, it will accomplish the purpose God intended. That may mean an immediate change in my (or someone else’s) life. It might be the softening of my (or someone else’s) heart, preparing me (or them) to make the change God desires. We certainly have personal responsibility as we respond to the Holy Spirit’s work in our hearts. But as we are faithful to be in God’s Word, we can be sure He will use it to accompli sh His purposes in our lives. That’s important for me to know about myself. It’s equally (if not more so) important for me to know about my children. Each of us belongs to the Lord. We are His children. We are a work in progress. 1Tchividjian, Gigi, and Ruth Bell Graham. “Children of the Heavenly Father.” A Quiet Knowing. Nashville, Tenn.: W Pub., 2001. 20-22. Print. Thank you for this beautiful assurance–I needed it today! I’ve read the verse before, and I know it’s in the Bible, but it’s so good to see it again–confirmation that my job isn’t to change lives–it’s to introduce people to the one who really CAN change lives! An important truth. One you know well, Anita. Such a great study of the word. You are absolutely right. Sometimes we try so hard to prune ourselves and focus on the ugliness instead of letting God do the work. I think when we have our focus in the right place, we are so much better able to give GRACE! What a blessing to focus on His ability and willingness! 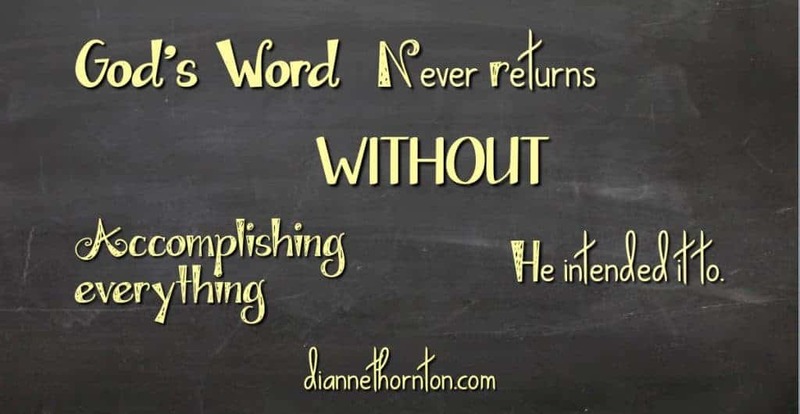 His word will accomplish what HE plans for it to. When sharing with people, I catch myself having my own agenda…I need to move out of the way and allow His purpose to be fulfilled. I also love the visual that when we stay connected to Jesus (the vine) the dead parts will fall away naturally as the new life blossoms. Thanks for paralleling that big tree with the vine! What a lovely assurance and reminder. I participate in an online Bible study group so that I have regular discussions about the word. I’m a relatively new Christian but I find that the more I dive in, the more peace I have in my days. I’m pinning this to my Deliberate FAITH board. Thanks for that, Jennifer! Your online Bible study group sounds really good! I attend a Tuesday group at our church–and nothing encourages like being together! So glad technology expands our borders! God’s got this! If I could just keep that in the forefront of my thinking everything would be so much better. Thank you for this beautiful reminder. I think I’ll write that on post its and place them around the house. Blessings to you!! As writers, we need to know that, right! Sometimes I look at things I’ve written and think … ugh … I didn’t do that right. 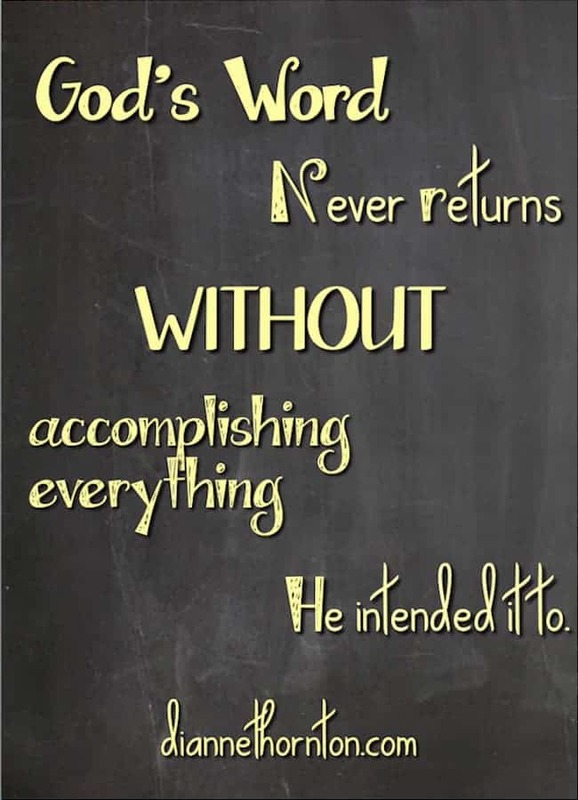 But then … God will use it to accomplish HIS purposes!